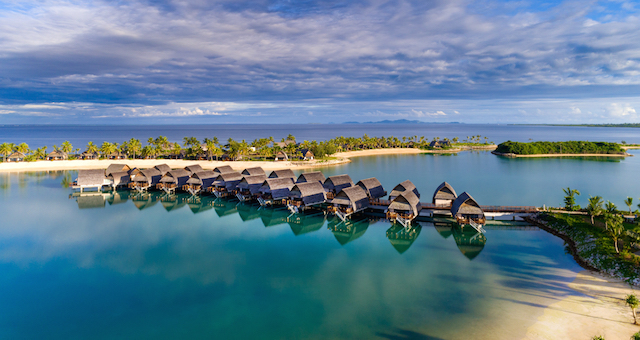 The new InterContinental Fiji Golf Resort and Spa has confirmed opening dates for the resort's new Club InterContinental, which will be ready for bookings from June 1, 2010, the only resort in Fiji to offer a Club product for its premium guests. The new InterContinental Fiji Golf Resort & Spa has confirmed opening dates for the resort’s new Club InterContinental, which will be ready for bookings from 1 June 2010, the only resort in Fiji to offer a Club product for its premium guests. InterContinental Fiji Golf Resort & Spa general manager, Neil Houghton said the property is about to raise the bar with the opening of the Club. “Being the first resort in Fiji to introduce a Club concept, we’ve been working for months to deliver something visitors to the archipelago have never seen here before,” he said. Set high on the hill, with sweeping views of Natadola Bay, the resort’s Club InterContinental will offer guests the exclusivity of a resort within a resort. Surrounding its private entertainment pavilion the property will include an infinity pool, lounge area and al fresco dining, The Club boasts 55 hilltop suites- many featuring private plunge pools. Access to Club InterContinental at InterContinental Fiji comes with a 24-hour personalised butler service, complimentary breakfast in a choice of three stunning venues, afternoon tea and cocktails with canapés in the evening. “With the addition of Club InterContinental, we are certain the resort’s reputation as a luxurious pacific retreat will be elevated even further,” said Houghton. Visit the website for more information on bringing your next incentive group or confernce.